Britain has a new marilyn after an announcement today by three amateur hill surveyors. Graham Jackson, Myrddyn Phillips and John Barnard’s efforts in measuring peaks the length of Britain during the last three months have resulted in the elevation of a Perthshire hill into the list of marilyns – hills with at least 150m (492ft) of drop between them and the land around them. Creag na Criche, listed by the Ordnance Survey as 456m (1,496) and overlooking Little Glenshee, north-west of Perth, was formerly classed as a sub-marilyn. 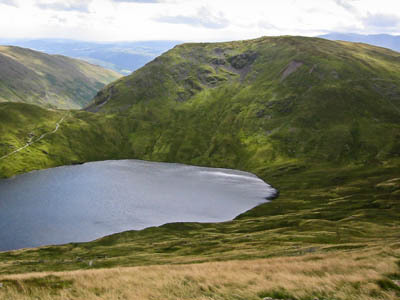 The men, who provided grough with a report of their similar elevation of the Welsh marilyn Mynydd y Cwm in April, also confirmed the status of Seat Sandal in the Lake District, which has 151.85m between it and its col. The Hill of Tillymorgan, north-west of Aberdeen, also had its marilyn status confirmed. The trio of hill sleuths announced their findings today on an Internet group. Staying in the sub-marilyn set are Creag an t-Sithein in Gleann Fearnach and Gamallt, north-west of Llandrindod Wells.